ALLAN & ASHCRAFT reach another important milestone in their fast forward career. 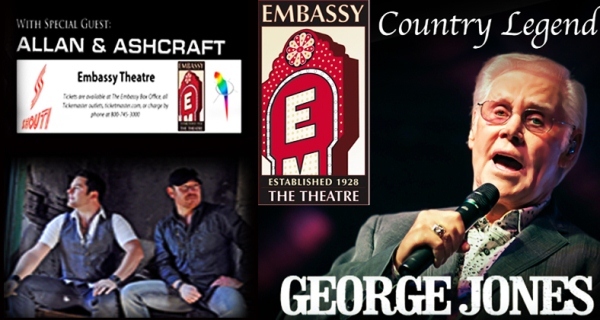 This Saturday, September 29, 2012, they will be the opening act for George Jones at the Embassy Theatre in Ft. Wayne, IN. As everyone knows this is the beginning of George’s last touring season, and for Allan & Ashcraft to be able to be a part of the show with this country music icon, is a giant step in their career. This is an exciting time for this super duet team, to be included as the opening act for George during his Final Grand Tour. They will be performing to a sold out audience that will surely gain them new fans and recognition in the music circles. 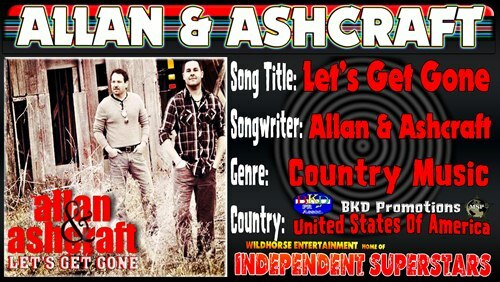 You can download Allan & Ashcraft hit song ” Let’s Get Gone ” free by clicking on this banner. Compliments of Marty Martel Promotions, Allan & Ashcraft and Wildhorse Entertainment The Home Of Independent Superstars. 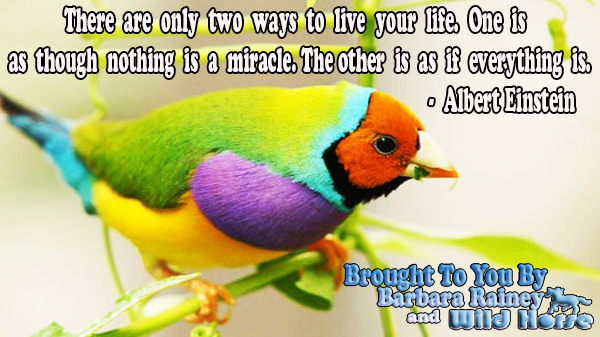 Barbara Rainey Only Two Ways To Live Your Life ? Have a great week keeping it COUNTRY!! Why Did I Write This Song ? Sometimes we, as songwriters, tend to forget the most basic question when we are writing a song. That is what are people supposed to feel when they are through listening to our masterpiece ? I cannot harp enough on the fact that just because some of the words rhyme does not make a song. It needs a reason to exist, a job to do in other words. I will start with my favorite, the story song. The rules to this format are simple enough. They are the same as the rules for writing a short story. It has to have a beginning where you introduce the characters and what they are trying to do. Then you have the middle part where you flesh out and explain a little more about the characters and what they are attempting to do or tell you and last it has to come to some kind of believable conclusion. This last part is the part that trips up a lot of writers. Always keep in mind that if it is not in the lyrics then no one but you knows it. The listener cannot read your mind so if it is not clearly explained then it didn’t happen for no one except you. Another format is what I call the “I Love You So Much I’m About To Pee My Pants Love Song”. 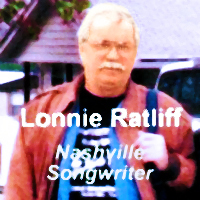 Now every songwriter book will tell you the positive love song is the most popular type of song there is and that is true enough but what they fail to mention is that every songwriter in the world knows this and the best songwriters (better than me and you) have been writing this format for hundreds of years. All I am saying is if you write this format you better do an excellent job and bring some new ideas to the table or no one is gonna get excited about cutting your “Love” song. The biggest problem I see with newly written Love Songs is the newer songwriters seem to be convinced that the longer the song is the better it is. I don’t recall any big hits over four minutes long but I can’t believe how many demos over five minutes I have seen in the last year. Most of these epic novel songs just say I Love You More Than and then they add a laundry list to that like More than banana pudding, automatic transmissions, farm raised catfish, figure eight stock car racing and the list goes on and on. The only good thing about that long Love Song is that it does not compete with the rest of us songwriters when it comes to getting cuts. 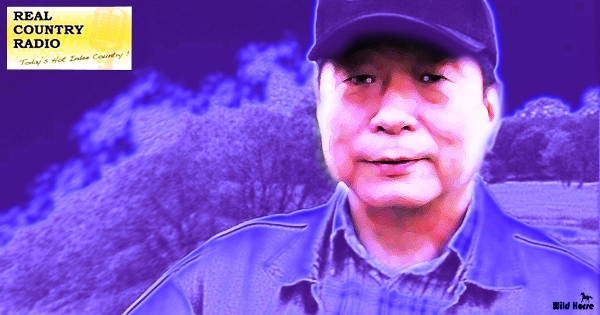 A format that is a lot of fun to write is Novelty and Time Sensitive songs. To write the time sensitive songs you need to be in the position to get the song out to the public very quickly because so much is out of your control. I remember back in the 2008 Primaries I had this, what I thought was a great idea. I was going to write two songs and release them about Hillary Clinton. One was an I Hate Hillary and the other was I Love Hillary so I would cover all bases. I figured I would just make them downloads on i-Tunes and sell a ton. Unfortunately, or actually fortunately as it turns out, I could never come up with the songs I needed and then Hillary lost the primary and my idea became worthless. Luckily I had never spent any money on it but it just goes to show when you are dealing with time sensitive songs you need to be prepared for big losses. The comedy genre is pretty much a crap shoot but I continue to write and release comedy songs because I just love writing and promoting them. 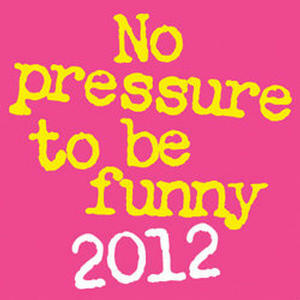 All I got to say about comedy is if you go down that road understand one thing. You really never know what people are gonna consider funny so it should just be a labor of love.